If you were to look on Pinterest or at any of the Mommy homeschooling blogs you would think that everything is perfect and wonderful every day. That every homeschooling Mom wakes up at sunrise and prepares a healthy, home cooked meal. That she has her lesson plans all set to go. That her kids wake up and spout their latin verbs while brushing their teeth and happily doing their chores. That Mom is dressed to impress, as are her children. That she has an immaculate home. Her youngest would have a day filled with stories and hands on activities. Painting, play dough, and an assortment of Montessori style projects keep that rascal busy. Well, I'm here to tell you that is a bunch of phony bologna! Most of us are balancing a ton of stuff and just trying to get by. If I'm working on a lesson with the teens it usually means my littlest is playing in the toilet. Dinner is often takeout or grilled cheese because both are easy to get going after a long day. My teens tend to wake before me most days because I'm up all night fighting the littles to sleep. Don't get me wrong, I love our crazy, chaotic life. It just isn't pinterest worthy. I saw a meme that said something like - I always wanted to be a pinterest Mom, turns out I'm more of an amazon prime mom - this IS ME! So, when the days are long and the worrying sets in what do I do to mentally prep for homeschooling? I've learned some things that help me. Trust me I often have to remind myself. Especially at the beginning of the year when getting into a routine can be stressful. When it takes two days to do one days work because the curriculum is so new. I find that this is the biggest key to our day going smooth. When I start my day off with prayer time (and devotions) my mental state is always considerably better than the times it doesn't happen. The days we meet around the table or on the couch and take time to talk about the Lord and pray together tend to start smoother. Maybe it is that attitude adjustment first thing in the morning, I'm not sure but I know it works. It is impossible to do it all. There just isn't enough time to do everything. I had to give myself permission not to do everything early on. I prioritize. It helps. I set out each year, week and day with a list of expectations to accomplish but I know that some days it just won't happen. Things come up. Relatives visit, kids get sick, sometimes a lesson is hard and needs extra time. It is okay! I struggle with this one but it is one area I'm working on. If I start the day with a full sink of dishes it seems to take all morning to get that done. We try to straighten before bedtime so we are waking to a fairly clean house. Now don't get me wrong my idea of clean is not perfect. It usually means the dishes are done, floors are clear and swept and table is clean and wiped. It isn't a whole lot to ask for and every one pitches in. 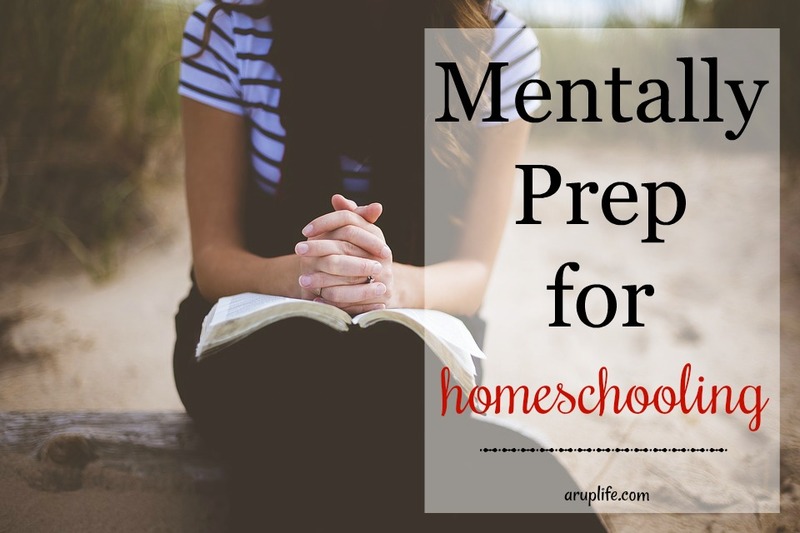 What do you do to mentally prep for homeschooling each day? What??? Everyday of homeschool isn't pinterest bliss?? LOL. We usually start ok, but math doesn't always go so well. We definitely rely on God's word and prayer.